An ancient Ayurvedic oral self-care ritual is reimagined for today with this beginner-friendly kit. According to the ancient Hindu medicine system of Ayurveda, digestion begins in the mouth. For thousands of years, people have followed this natural oral self-care ritual to keep their smiles pearly white and help their digestive system working as it should. Curious? This kit makes it super easy for beginners to develop and maintain a daily practice of oil pulling and tongue cleaning. Best done first thing in the morning before eating or drinking, clean your tongue with the copper tool, follow with cinnamon-flavored oil pulling, and finish your oral hygiene ritual by brushing your teeth. 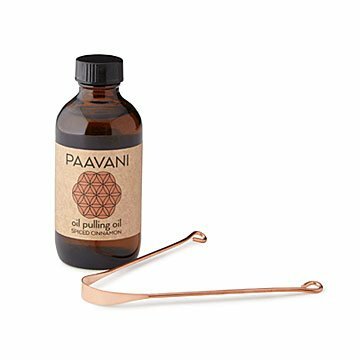 A great way to initiate or deepen a personal Ayurvedic practice, think of the kit as as the neti pot's lesser known sister. Handmade by a team in Nevada City, California.